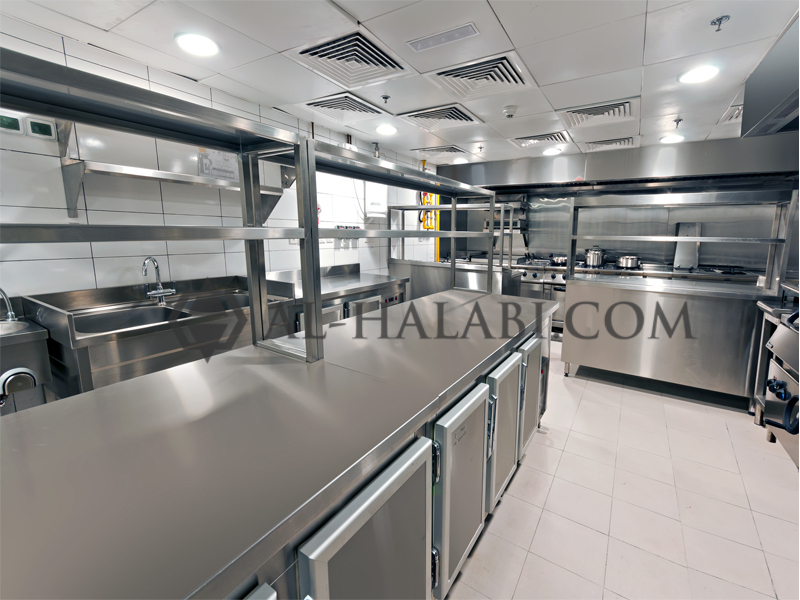 Why do top hotels, restaurants, fast food chains, hospitals, cafeterias, and other commercial establishments turn to Al-Halabi when they need commercial kitchen equipment in Dubai? Maybe it is because of our proven experience in the manufacturing, installation, and maintenance of kitchen equipments in Dubai. For decades, the Al-Halabi name has been a symbol of quality. We have helped countless businesses get the kitchen equipment they need. Quality craftsmanship has been the hallmark of our company since its beginning, and businesses all across Dubai know they can trust us to exceed their expectations. Speaking of quality, when it comes to the manufacturing of restaurants kitchen equipment in Dubai, no other company can match the quality produced by Al-Halabi. We bring world-renowned engineering into your kitchen with a rare combination of technological mastery and uncommon elegance. Whether it’s a preparation table, oven, cabinets, or any other commercial kitchen equipment, you can be sure that you will always get the very best from Al-Halabi. That’s because every product we manufacture is the result of many years of research and development. Furthermore, our rigorous in-house quality standards mean that every nut and bolt is double-checked to ensure your kitchen equipment is the best it can be. Of course, other customers love us because of the level of customer service we provide. We pride ourselves on providing truly personal service. We take the time to really listen to your needs and develop imaginative solutions that turn your dream kitchen into a reality. There’s no challenge too big for us to handle. We listen, learn, assess, refine, and tailor each product to suit your specific needs, and we deliver results above and beyond your expectations, always with a smile. Don’t forget about our excellent value. When it comes to commercial kitchen equipment and hotel kitchen equipments in Dubai, you will not get a better value from anyone else. Our dynamic, flexible, and efficient products all come at the best value in the industry. Simply put, you won’t find lower prices on commercial kitchen equipment in Dubai of this level of quality. Our kitchen equipment is used by some of the world’s biggest restaurants, hotels, fast food chains, and other commercial establishments. We’re the manufacturer trusted by the biggest brands in the business, and we can help build the commercial or industrial kitchen that you need.